In early 2003, The Label Company in Anaheim, California—a profitable and reliable producer of prime labels serving the western United States—changed ownership. Like many label producers, The Label Company had been a successful family business, opening its doors in 1979 and nurtured by its founder. As in many similar companies, requests for quotation came in on the fax machine, and bids were prepared by hand. A prime label producer, The Label Company serves the personal health care, consumer goods, home improvement and entertainment industries. Since ownership changed, however, sales have more than doubled, and business is growing exponentially in a largely flat industry. This is the story of how the change occurred. When Eric Jones joined The Label Company as its new general manager in 2003, one of the first things he noticed was a line of employees waiting their turn to use the one computer in the business that had Email access. Determined to move the company solidly into the 21st century, Jones immediately began investigating the software available for managing label manufacturing businesses. 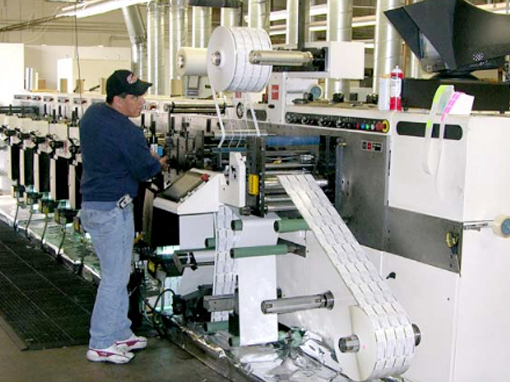 After thoroughly vetting the available programs, he installed the Label Traxx software package offered by Tailored Solutions of Milwaukee, Wisconsin.